Your Local Business Listing is the equivalent of a free Yellow Page add on Google, Yahoo!, Bing and dozens of other heavily searched websites. It usually shows up next to a map, but not always. Here’s an example of what a customer will see when they do a search for the term “Car Rental.” in Fort Myers, Florida. The goal of Local Search Marketing is to get your business listing on the map, to the top of the map and make it the most compelling listing on the page … and do it without spending money on advertising. When optimized, your business listing will generate significantly more leads than a Yellow Page ad. How is a Local Business Listing Different from a Yellow Page Ad? Unlike a Yellow Page ad, your local business listing can include an interactive map, color photos, videos, up to a 1,000 character description of your business and the ability to be listed in multiple categories. Your business is not listed in alphabetical order. You have the ability to enhance your listing so that it shows up at the top of the results for the products and services you offer. You can also enhance it so that it’s the most compelling listing on the page. Oh, did I mention IT’S FREE and there are NO MONTHLY FEES and that more people search for your business on-line today than in the Yellow Pages? Why Is Local Search Marketing So Powerful? Local Search allows customers to easily find your business even if you don’t have a website. They can contact you from their computer, their smart phones, their GPS devices and more. Local Search allows your business to be seen where and when your customers are looking for you. How Do I Know If Local Search Marketing Is Right For My Business? That’s easy. Just answer these three questions. The more Yes answers you have, the better Local Search Marketing is going to serve you. Do you or your competitors advertise in the Yellow Pages? 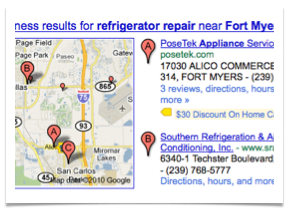 Does a map show up when you do a search on Google for the products or services you offer? Would you like to stop spending money on advertising? Results will vary based on your location, your industry and your willingness to participate in your own success. The vast majority of people who undertake a local search marketing campaign see results in less than 90 days, and many see results in less than 30 days. Please read our TESTIMONIAL page and see how other business owners have profited from their local search marketing efforts. How Will I Know If My Local Search Marketing Is Working? Many SEO companies will tell you that your local search marketing campaign is working if your business shows up in the search engines. They’re only half right. Our philosophy is that the only true measure of success is new business. If you’re not generating qualified leads and converting them into customers, it’s not working. The only way you will know if your local search marketing is working is to ask every single customer how they found you. Local search marketing, like all forms of advertising and marketing is about tracking who calls you, who visits your store and who buys what you’re selling. Success is in the results, and the results are in the sales. No one knows your business better than you do. Read everything you can about Local Search Marketing on this site and then get to work. You will find the information you need to do the keyword research, write compelling copy, select the proper categories for your listing, add photos, videos, coupons and more. Now, here comes the most important part. The businesses that jump to the top of the search results page and generate most of the leads do two additional things that their competitors don’t do. They generate additional local and industry specific business citations and they encourage their happy customers to review their business on appropriate websites. No one can do this for you. Can You Help Me Optimize and Publicize My Business? Yes! We are a Local Search Marketing Research and Training Company, but we offer three ways to help you optimize and publicize your business listing on the Internet. If you’re interested in getting your business listing to the front page of the search engines and making it the most compelling listing on the page … and you want to understand how the process is done along the way, please give us a call here in Hawaii at 808-891-0449. We’ll be happy to spend some time with you on the telephone discussing if Local Search Marketing is right for your business. Hello, I stumbled across your site by happenstance. Noticed your video re: local search was from 2009. Are you still doing this? WHat of the changes GOOGle has made in 2011? Have you an updated video? I do this similarly in my local market.